In the April-June quarter to the two-wheeler exports industry Honda Motorcycle & Scooter India Pvt. Ltd. has become the largest volume contributor with almost one-third of the total share. In Q1 of 2017-18, contributing 69 % of overall sales Honda also leads domestic sales. For the second quarter, Honda now leads domestic sales in a row. In the June quarter, to be precise 29.5 % of the incremental export volume or three-times more than the industry volume, Honda has contributed almost a third of a 44 % growth in exports. According to data published by the Society of Indian Automobile Manufacturers (SIAM), during the April-June period the two-wheeler industry shipped a total 6, 62,534 units in terms of exports up 15 % over the same period last year, recording a growth of 44 % over year-on-year, Honda shipped 81,862 units during the period. To the total volumes overseas shipments by Honda Motorcycle and Scooter India contributed 29.5 % to the total volumes and in the reporting period, it is similar to what the nearest competitor added. Of total exports, 45 % has been contributed by the Honda Dio. In the domestic market of the total incremental sales, 68.8 % has been contributed by Honda. While in Q1, the industry clocked 48,96,170 units during the same period Honda sold 14,78,478 units. 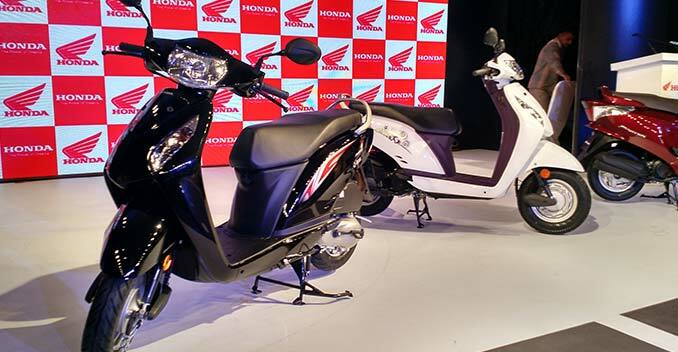 By the industry Out of the total addition of 3,53,434 units 2,40,604 units sold by Honda alone, and it is led by Honda Activa close to 65 % of this, it contributed. The Senior Vice-President, Sales & Marketing, Honda Motorcycle & Scooter India Yadvinder Singh Guleria commenting on this achievement, said that in the June quarter on the export front our market share among the industry went up 2 % age points to 12 % as we have done so well. The automatic scooter Dio is responsible for this unprecedented jump in export, followed by the Navi, it contributes 45 % of its total shipment. Followed by the bikes Twister and Hornet, in overseas markets, the Dio continues to be our flagship chipping in with almost 45 % of the volume. with 4,000 units the Navi has also been a great contributor. Now for the Navi, we are getting huge orders from Latin America too. Now taking the overall share to 35 %, by newer markets and higher orders from Latin America, the volume expansion has also been driven up from 30 % last year. The Latin American markets like Guatemala, Columbia, El Salvador and Bolivia, and Mexico, Honda is already exporting CKD and CBU models. This month from Ecuador, Honda has also got orders. To hold 65 % of Honda’s two-wheeler exports, the SAARC markets led by Nepal, Sri Lanka and Bangladesh still continue.